Jack’s can supply you with replacement Roof belts to help with your do it yourself repair or maintenance project. Look below to find the replacement Roof belts you need to get the job done. 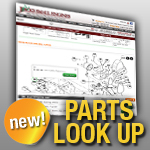 When you need lawn mower parts, like belts, think Jack’s first!